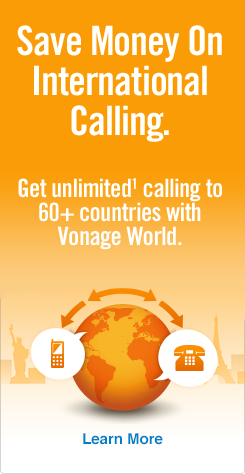 Vonage Has the Cure for Your UK Calling Card Blues! Say goodbye to expensive calling cards to UK. Vonage introduces a new, amazingly affordable Digital Calling Card! It’s the best calling card to UK with its high-quality international calls, low per-minute rates and special bonus calling credit. That’s right, we’ll give you bonus credit every time you put more than $5 on your card. You could receive up to a 40% bonus credit when you buy $25 worth of minutes. Low per-minute calling rates to many popular countries. Only pay for the minutes you use. Auto-refill will ensure you avoid calls getting cut off. No connection fees, minimum charges, gimmicks or hidden charges. Reliable calling over Vonage’s network. Calling to landlines and mobiles. Convenience of refilling the calling card whenever you want. And just when you thought this UK calling card couldn’t get any better — our rates to U.K. mobiles are up to 49% less than PennyTalk®’s. And the account is self-service, meaning you manage it on your own time. You won’t get any operator calling you in the middle of dinner asking you to refill your account. You can do it all online and on your own time. So whether you’re calling Belfast, Edinburgh or London, Vonage’s Digital Calling Cards cover all your calls. So get these calling cards for UK and start talking today! Need a refresher on how to call the UK? View our post on how to call the UK from the U.S. for all the dialing details.